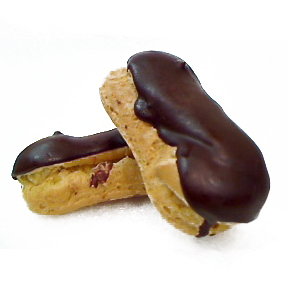 Ingredients: Water, wheat, gluten, corn starch, flax, oat fiber, whole wheat flour, oat bran, isolated soy protein, soy flour, soy oil, sesame flour, salt, sodium acid pyrophosphate, dextrose, sodium bicarbonate, calcium propionate (a preservative), fumeric acid, potassium sorbate, monodiglycerides, sucralose, sodium metabisulfite, yeast. 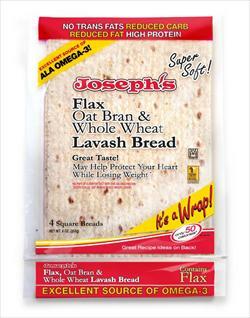 From Joseph's, "Joseph's provides you with a healthy, reduced carb, high protein Lavash bread, now containing Flax, an excellent source of Omega-3! 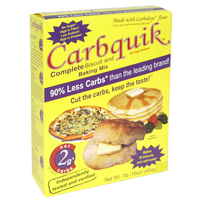 This Lavash has no cholesterol and contains three healthy ingredients: Flax, Oat Bran and Whole Wheat which may help protect your heart, while losing weight! "